The pale yellow colonial house at 124 Thayer Pond Road in New Canaan is only steps away from the Lake Club on Thayers Pond on the New Canaan and Wilton town lines. 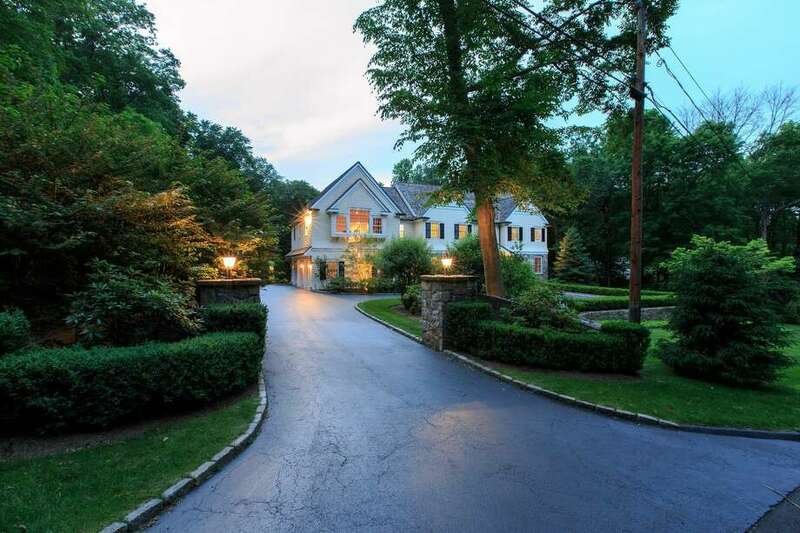 For the price there is a lot of house — 8503 square feet of living space, a lot of property, and a lot of local amenities starting with the location in a friendly neighborhood, only steps to the Lake Club, and just three miles from downtown New Canaan and the train station. The Lake Club, which requires membership, sits on a 15-acre parcel on the Wilton-New Canaan border. Should the next residents of this house become members they are not just getting a new home, but also a way of life. The Club offers 12 Har-Tru tennis courts, paddle tennis, swimming, diving, water polo and boating. There are recreational and intra-club competitive teams. Paddle boats, row boats, canoes and kayaks are available for members to use and there is an annual Fishing Derby on the lake, named Thayers Pond. “There are 300 families that are members of this unique club and everyone, regardless of age, feels as if the Lake Club is their home away from home,” the Lake Club website said. This meticulously maintained shingle, stone and wood house with white trim and black shutters was built in 2005 with great attention to detail. It sits on a 2.1-acre level and sloping property. Parting Brook cuts through a portion of the property but it represents no danger of causing damage because the house is set up on a hill. The entrance to the ample driveway is market by stone pillars topped with lanterns. The columned, covered front entrance with sidelights opens to the two-story foyer, where there is a hardwood floor, arched doorways topped with keystones, Wainscoting on the lower walls and a powder room. The formal living room has deep crown molding, tall windows and a marble fireplace. French doors open to the office, which has a coffered ceiling. The formal dining room has chair railing and French-style café doors opening to the butler’s pantry and wet bar. The updated gourmet kitchen, eat-in area and family room are all open one to the other. There is a marble fireplace in the family room flanked by built-in bookshelves and cabinetry. There are also French doors to the bluestone patio. In the kitchen there are many features including the center island with a breakfast bar, granite counters, built-in desk area, large walk-in pantry, hardwood floor and ceramic tile backsplash. Appliances include the Viking Professional six-burner range. The mudroom has a slate floor, access to the rear staircase, a half bath and informal front entrance. On the second floor there are five bedrooms — one of which is used as an office, and a secondary family room with a tall ceiling and long window seat. The master suite has a limestone fireplace, sitting area, tray ceiling, a door to a private balcony, two walk-in closets, dressing room, window seat and two marble master baths. One has a dark green marble floor and the other has a white and amber-colored marble floor arranged in a harlequin pattern. The finished third floor has a playroom and a full bath. The finished walk-out lower level has an exercise area, game room and a full bath. For more information or to make an appointment to see the house contact Kathy Tanner of Houlihan Lawrence at 203-856-6265 or ktanner45@yahoo.com.